One of my favorite aspects of film photography is spending time in the darkroom. While others are mulling over what camera to shoot, what film stock to carry around, what developer to soup their film in, I’m in the darkroom asking myself, “How am I going to get my image on a piece of paper today?”. 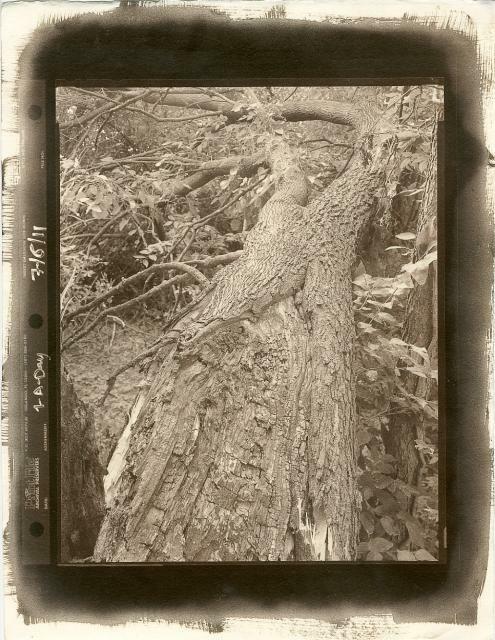 Most days, the answer is simple, a B&W on a piece of silver gelatin coated fiber paper. There are those days, however, where I just need to try something different. 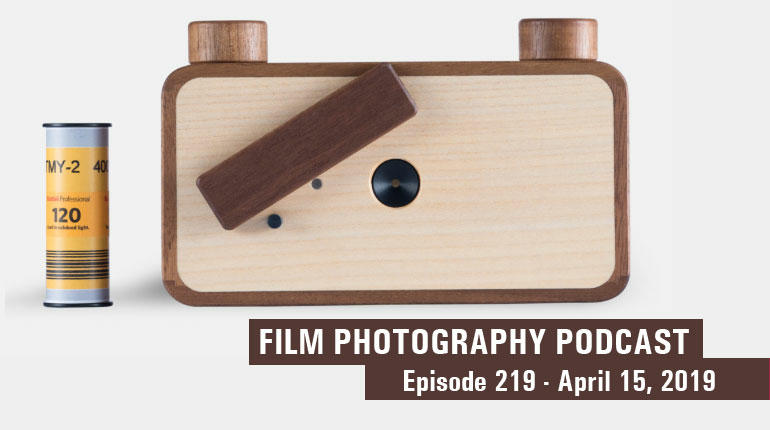 Here on FPP, we’ve already covered Lith Printing, an alternative process that deviates slightly from silver gelatin printing, but today, we’re stepping outside of the darkroom for a process that the goes back, way back to the early days of photography. Vandyke brown printing, a derivative of iron-silver print processes (argentotypes) from 1842, takes its name from the color cast of final print, a deep brown similar to popular paint pigment, Vandyke brown. Like many of photography’s earlier processes, VDB is a contact printing process needing ultraviolet(UV) light to make the exposure onto a piece of coated paper. It’s a process that’s easy, affordable, and can be done without the need for a darkroom. Let’s get right to it! Here’s everything you need to get started printing your own VDB’s. Once the separate parts are thoroughly mixed, add the contents of Solution B to Solution A, in a dark glass bottle that can hold > 300mL of solution. Next, add Solution C to the bottle, cap, and label the solution for your records. Once mixed, Vandyke Brown sensitizer lasts up to one year if stored and refrigerated between uses. Next we move onto the paper used for Vandyke brown printing. Pretty much any good drawing or watercolor paper can be use for VDB, but the better the quality of the paper, the better quality you can expect from your final print. Watercolor papers typically come in two flavors, hot press and cold press. Hot press papers have a nice, smooth surface to them while cold press papers have a bit more weight and texture to them. A popular paper amongst all the handcoating alternative processes is Arches Platine, but most any of the fine art papers you can find at your local hobby store will suffice. Once we have a sensitizer ready and paper selected, it's time to coat the paper. For this UV sensitive coating, you can do this in a room with subdued incandescent light, but no window and/or fluorescent light, as this may lead to fogging in the final image. Using an eyedropper, count out 40-50 drops (for an 8x10" printing area) of sensitizer solution into a beaker or measuring shot glass. This typically ends up being ~4mL of solution. In one smooth, continuous movement, pour the sensitizer laterally along the surface of the paper, drawing a nice bead of liquid all the way across. With a slightly water dampened brush, immediately begin spreading the sensitizer out across the entire surface of the paper, brushing side to side, then the next series of strokes alternating top to bottom. Continue coating until the surface of the paper no longer has a glossy sheen from the sensitizer, and/or the sensitizer is not longer puddling at the edge of your brush strokes. After coating, you can gently dry the surface of the coated paper with a hair dryer set to low/no heat. Typically, the paper dries quickly, within 10-15 minutes, and is ready for exposure. Under the same subdued light used for coating, place the negative(s) to be printed onto the coated surface (should have a pale jungle green appearance) of the paper. Sandwich the paper and negative between two pieces of glass, and secure the sandwich with either some rubber bands or clamps, to ensure the negative doesn't move during exposure. Now the print is ready to be placed out in the daylight for its UV exposure. On a typical sunny day, exposures can be a short as 3-5 min. in direct sunlight, but can go as long as 20-30 min. in overcast conditions. As the print receives more and more UV light, the sensitized part of the paper will shift from that pale jungle green color, to a pale orange-brown tone. By the time it reaches a more brown tone, the print is ready for washing. In the case of VDB, exposure is also the development of the print, known to alternative process photographers as a Print Out Process (POP). So the only thing left to do with the image is wash and fix it. In a tray, start running some tap water at room temperature; if your tap water is more alkaline than average, add a little bit of citric acid (powder) to acidify the water. Under the same subdued light conditions as coating the paper, immerse the print in the water rinse for 2-3 min. 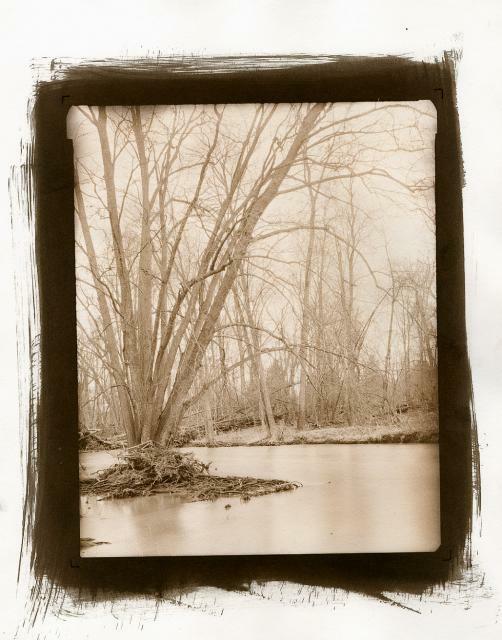 Immediately after immersion, the print should start turning a warm, sepia-brown that has a hint of orange in it. The print will appear very flat in contrast, but have no fear, the VDB print goes through several contrast "phases" during washing, and the contrast of your image should come back in the next step. After rinsing in water, move the print to a 3% solution of sodium thiosulfate, also known as old photographic hypo. 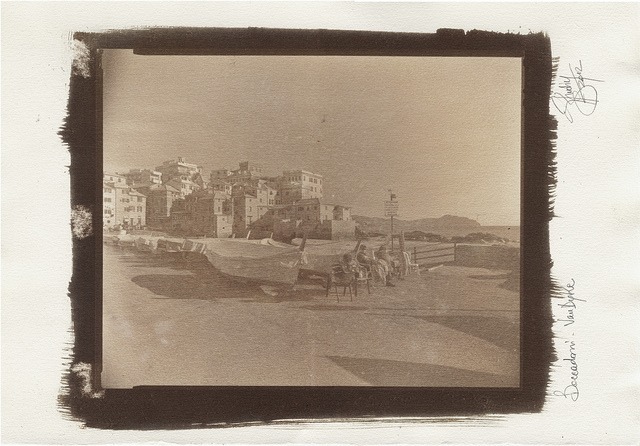 During this stage of fixing, the print will darken some more, but fade from warmer to darker brown; contrast in the image will also return, but be roughly twice as dark as when the image "printed out" during exposure. Fixing the image takes very little time at all, from 20 sec. - 1 min. before the image starts to bleach out from the alkaline environment of the fixer. The less time in the fixer, the colder and darker brown the final image will be after drying. From the fixer, the print can be then moved to another tray for the final washing step. The last part of the VDB process, final washing is incredibly important in removing every last trace of thiosulfate fixer from the fibers of the paper. The more trace left in the paper, the quicker the image will fade over time. Wash the image for 30-40 min. in tap water, being sure to constantly change out the wash bath, or to keep the faucet running at a slow, steady pace. To speed up these wash times, you can wash the print in a hypo clearning bath, approximately 1/2 the working strength that you'd use for normal photographic paper, for 2 minutes, then final wash in water for another 10-15 min. From there, hang the print to dry overnight, and you can come back the next day for a beautiful, deep dark brown print with lovely tonal separation. Well, that's the basic Vandyke Brown print process. There are many more advanced techniques that can be used to modify the final image before and after making the exposure, but this guide will definitely get you on your way to making your own VDB's quickly and easily. For the visually inclined wanting to see just how easy these steps are to carry out, here's a video made by a good Flickr contact of mine, Giorgio Bordin. Giorgio is an accomplished, multitalented artist that produces fine works in watercolor, ink, and etching on top of being a top notch film photographer. He's self-produced a multitude of videos on alternative process, you can check the rest of his alternative process videos on his YouTube channel. For more information on Vandyke brown printing, you can go to any of these sites below and find a wealth of information and techniques to refine your process. Vandyke printing is one my personal favorite alternative processes, and I hope everyone reading this gives it a try sometime. Happy printing, and long live film!